A Democratic congressional candidate in Washington wrote in her 1986 doctoral thesis that she was inspired by communists, socialists, and anarchists. Lisa Brown named communist Elizabeth Gurley Flynn and anarchist Emma Goldman as influences in the thesis, the Washington Examiner reports. "As a feminist … I am also inspired by great women activists, such as Elizabeth Gurley Flynn and Emma Goldman," she wrote. "Other great women in my life include Golie Jansen, the members of the Boulder Socialist-Feminist Collective, and the members of the Spokane Women’s Group," she wrote. Flynn became chairwoman of the U.S. Communist Party in 1961 and argued capitalism was incompatible with "human welfare." A 1917 New York Times article described Goldman as one of the "two most notorious anarchists in the United States." President William McKinley’s assassin, anarchist Leon Czolgosz, admired her. In a 1916 essay entitled "Do You Believe in Patriotism?," Flynn argued loyalty to class trumps loyalty to country. "The train on which I write rushes by factories where murder instruments are made for gold. I would be ashamed to be patriotic of such a country," she wrote. "In the black smoke belched from their chimneys, I see the ghostly faces of dead workers–our poor, deluded slain brothers," she continued. "I re-affirm my faith, ‘It is better to be a traitor to your country than a traitor to your class!’"
Goldman’s writings are similarly inflammatory. Discussing marriage’s effect on women, she once wrote that it "condemns her to life-long dependency, to parasitism, to complete uselessness, individual as well as social." 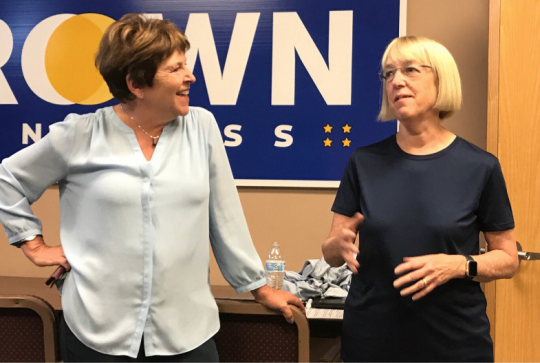 Brown is running what is expected to a competitive race against House Republican Conference chair Cathy McMorris Rodgers in Washington’s 5th Congressional District. The Cook Political Report rates it as leaning Republican. Polls from last month show McMorris Rodgers with a small lead over Brown. This entry was posted in Politics and tagged 2018 Election, Cathy McMorris Rodgers, Washington. Bookmark the permalink.